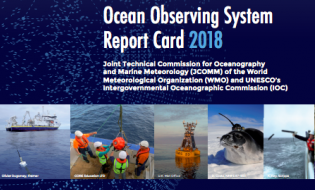 A new Ocean Observing System report card provides a snapshot of ocean observations, which are critical to predict and manage extreme weather and coastal hazards as well as to monitor the state of our seas. Real-time ocean observations are critical to predict, manage and mitigate the effects of extreme weather events that have high impact on the safety of life, property and the economy. For example surface measurements from ships, drifters and buoys provide critical information for marine forecasts for shipping and fisheries; additionally warmer ocean temperatures, rising sea level and variability in the major boundary currents can influence natural phenomena such as tropical cyclones. In situ and satellite observations, particularly of upper ocean temperature and salinity ahead of tropical cyclones, are fundamental to improve the representation of the upper ocean thermal structure that significantly influence the development and the intensification of tropical cyclones.